Today we write about two exciting recent discoveries. You’ve probably heard us praise Churchill’s bibliographer, Ron Cohen. That’s because Ron literally wrote the book on Churchill’s published works. Nearly 25 years of exhaustive research went into his indispensable three-volume, 2,183-page Bibliography of the Writings of Sir Winston Churchill. No less an authority than Sir Martin Gilbert effusively praised Ron’s work, calling it: “…a high point – and surely a peak – of Churchill bibliographic research… adding not only to the bibliographer’s art, but to knowledge of Winston Churchill himself.” Published in 2006, Ron’s Bibliography seeks to detail every single edition, issue, state, printing, and variant of every printed work authored by, or with a contribution from, Winston S. Churchill. It’s unequivocally the most thorough bibliography – for any author – that we work with in the bookselling trade. Even Ron did not see it all. In recent years, we have vexed poor Ron by sending him emendations to the Bibliography. We wrote about a few of our discoveries in a blog post a year ago called The Hunt. Recently, we made two more discoveries. And they’re really cool. 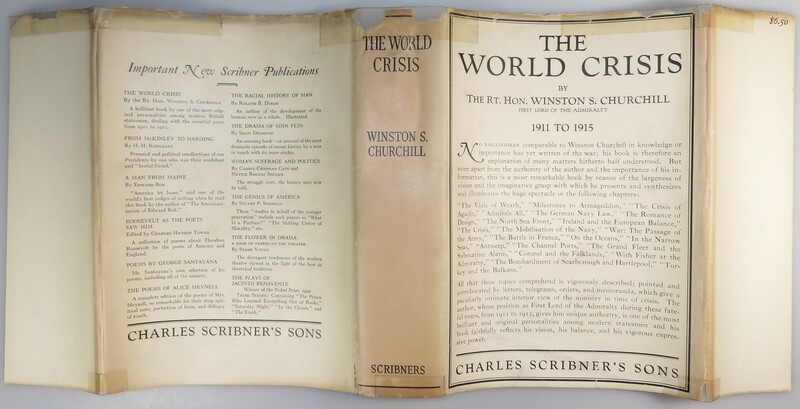 The first discovery is a previously unrecorded dust jacket variant for the U.S. first edition, first printing of the first volume of The World Crisis (1923). 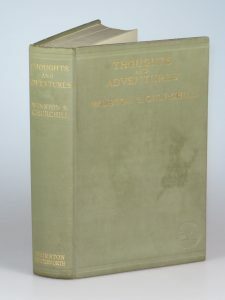 The second discovery is a previously unrecorded binding variant for the first edition, first printing of Churchill’s Thoughts and Adventures (1932). 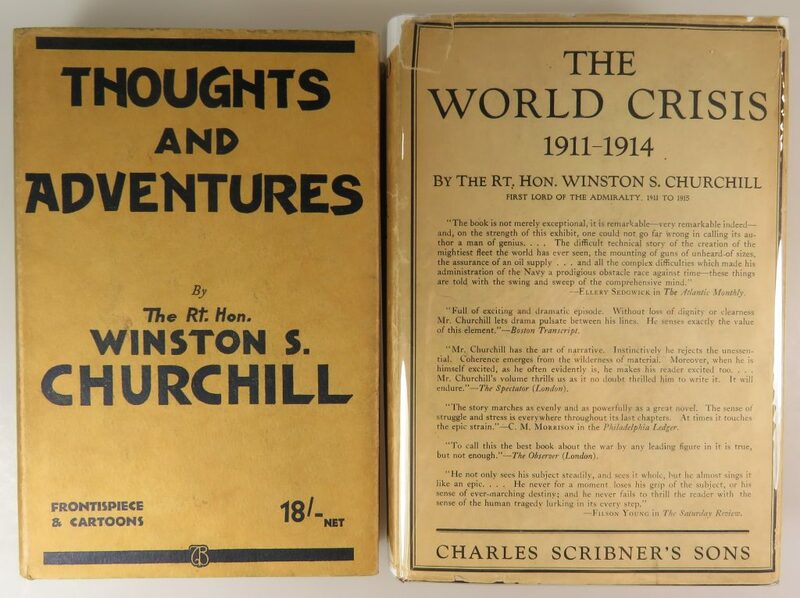 The World Crisis – Churchill’s history of the First World War – was published in six volumes between 1923 and 1931. The first volume, 1911-1914, covered the first four years Churchill spent as First Lord of the Admiralty, as well as the beginning of the war. April 1923 publication of the U.S. edition by Charles Scribner’s Sons preceded its British counterpart (Thornton Butterworth Ltd.), making the U.S. the true first edition. We know of only three surviving first printing, first issue dust jackets for the Scribner’s 1911-1914 volume (two of them with significant loss). They look like this. But no bibliographer has ever recorded and we have never seen this later issue first printing dust jacket. As you can see from the images, these first printing jackets are quite different. In many ways, the changes to the second issue jacket are a major aesthetic and contextual improvement, more concretely connecting the book beneath to both its title and to its place in The World Crisis as a series. 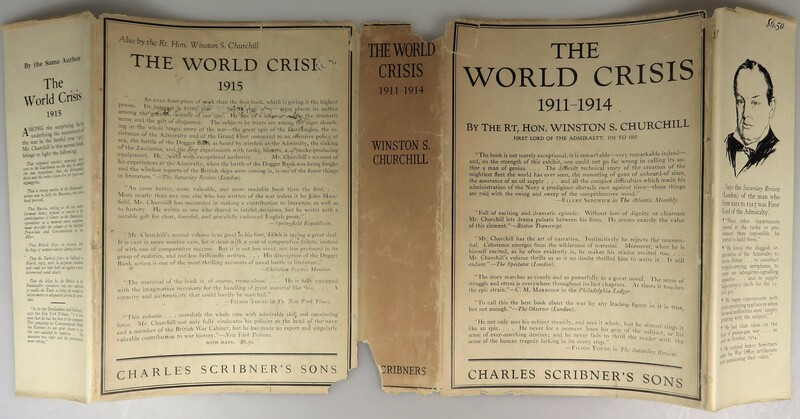 The spine of the second issue jacket adds “1911-1914” below “The World Crisis”, clarifying that this is the first volume. The front face also adds “1911-1914” and the text consists of six reviews. The rear face contains reviews of the second volume, 1915, which was published in October 1923. The front flap features the same “$6.50” price as the first issue jacket, but adds a striking image of Churchill over excerpts from the Saturday Review. The rear flap – blank on the first issue jacket – adds a blurb for the 1915 volume. Dust jackets of later printings – the 1928 second printing and the 1930 third and final printing – differ substantially, respectively advertising the 1916-1918 volumes (published 1927) and The Aftermath (published 1929). This jacket came to us wrapped around a gorgeously bright first edition, first printing binding variant that, as testified by condition, had clearly spent life jacketed. While we can never be sure of singularity, it’s certainly plausible that this is the sole surviving example of this jacket. Please find another and prove us wrong! In the meantime, this noteworthy jacket anchors a unique, fully jacketed set of The World Crisis listed HERE. 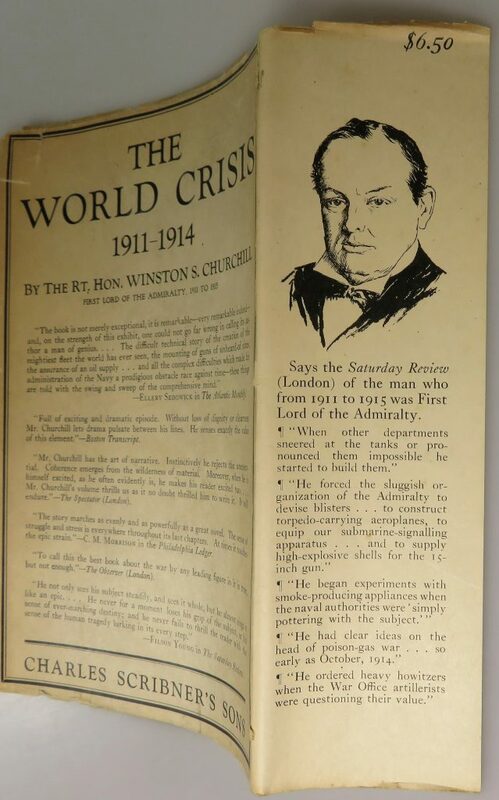 The sixth and final volume of The World Crisis was published in 1931. 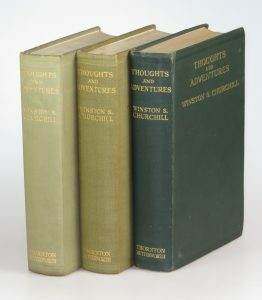 The next year, Churchill published something quite different – a stand-alone volume titled (in the UK) Thoughts and Adventures. Which brings us to our second recent find. This one a variant binding, not a variant dust jacket. There were a total of four printings of the first edition (all in November & December 1932). Unique to the first edition was a coarse-grained, khaki-colored cloth characterized by Ron Cohen as “Moderate olive brown embossed calico-texture cloth.” Later first printings and all three subsequent printings were issued in a significantly darker “dark greyish green” cloth with a “dotted-line grain”. What we recently discovered, beneath a gorgeous first printing dust jacket, is an entirely different original publisher’s binding. This previously unrecorded binding variant is a distinctly lighter, pale green/olive cloth in a tighter weave than the khaki cloth unique to the first printing. The differences between all three bindings are readily apparent. There’s no question that pale green is the original cloth binding color. This copy was discovered beneath a magnificent first printing dust jacket. Despite a stain on the front cover – ostensibly from incidental moisture exposure or handling – the binding is bright and clean as only a jacketed copy can be. The color is unequivocally original; we note absolutely no color difference between the spine, covers, and the cloth turn-ins bordering the pastedowns. We’ve never seen or heard of another bound thus. The logical speculation is that this cloth was used sparingly and very early in the first printing binding process, since it’s known that, at some point during the first printing, the khaki cloth yielded to the darker green, dotted-line grain cloth. This copy has just been listed for sale by us HERE. The lesson of both of these finds is that even after so many years and such an impressively exhaustive bibliography, there are still discoveries to make. We’ll keep looking. And we’ll keep sharing with what we find!